I'm gonna cry . . . I might be even sadder when this season's over than I was when Jimmer graduated. And that's saying A LOT. 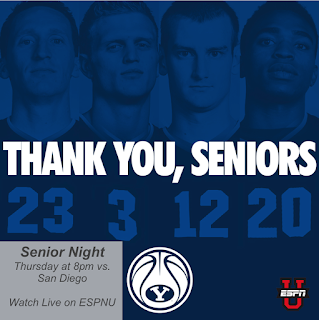 Tomorrow night, it will be time to say goodbye to 4 amazing basketball players as they (except in the event of an NIT appearance) play their last game in the Marriott Center . . .
Tyler Haws. Tyler is amazing. There are no words to express how sad I am that he's graduating. He will leave as BYU's all-time leading scorer and someone who was grossly underrated for his ability to quietly score 20+ points almost every single game. I really, really hope he gets a shot in the NBA because I think he definitely has the potential. He's not as flashy as Jimmer was, but he's equally good a scorer and much better at defense. Good luck, Ty! I hope for nothing but the best for you. Skyler Halford. Although Skyler showed brief moments of Matt Carlino-like frantic insanity, he has been much more consistent than Matty and has always been good at giving a defensive spark and energy when it was needed most. He always seems to have a good attitude and never get frustrated or angry, even during tough times. Anson Winder. I really hope Anson is able to recover from his injury enough to play at least a little bit on Senior Night. I remember when he was red shirting Jimmer's senior year and I always felt bad for him that he wasn't able to participate on the court during such a magical season. Despite being plagued by injuries, Anson has given the Cougars a great boost in both scoring and defense the last couple of years, and I think he definitely wins my "most improved" award for this senior class. Josh Sharp. I'm so glad Josh has finally gotten back on the court these last few games to show what he's really made of, and I hope he continues to finish out his senior season in style. The thing about Josh is that his body doesn't really match his skills very well (he's tiny compared to other guys who do what he does), but he makes it work. You'd never think just looking at him that he could throw down the monstrous dunks he gets from time to time. He's also very quiet and unassuming-- he almost looks bored most of the time, even when he's playing, but he's got a great sense of humor and can definitely ball with the best of 'em. Nate Austin is a senior, too, but the odds are good that he will receive a medical red shirt, so hopefully he'll be back! 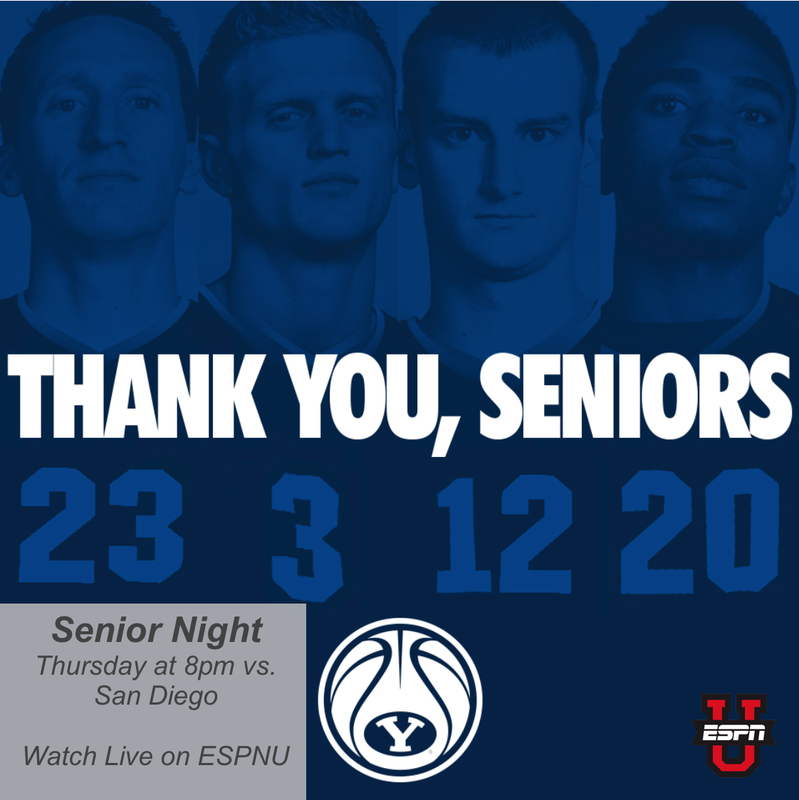 Let's go get them Toreros tomorrow night, preferably capped by at least 35 points from Tyler so he can pass Jimmer on the all-time scoring list at home . . . and maybe even a 6th triple double for Kyle. Thank you, seniors! It will be tough to replace these guys, but the future of Cougar Hoops is bright!